Part of the twin hotels ( the upcoming Ramada Plaza Lucknow Hotel ) & Convention Centre complex in Lucknow, Ramada Lucknow is located in the city’s commercial suburb, offering an extensive, never-before range of world-class hospitality & event facilities for the erstwhile City of Nawabs. 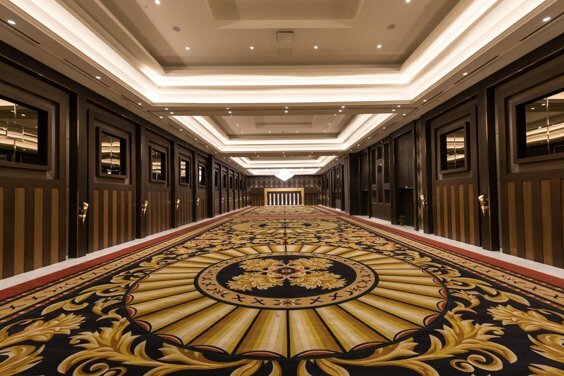 With contemporary design that brilliantly melds the individuality of Mughal-infused aesthetic articulations, the hotel & convention centre, spread over 10 acres, is ideal for both business, MICE and leisure guests. Relax in an elegant guest room or suite and take advantage of the state’s biggest meeting, dining and leisure facilities at Ramada Lucknow. Ramada Lucknow is a business & MICE (Meetings, Incentives, Conferences, and Events) hotel, ideal for value-seeking travelers and event planners, with dining, entertainment options that also promises to be a huge draw for weekend leisure, for families from Lucknow. Ramada Lucknow is the biggest banquet & convention hotel in Uttar Pradesh,India. 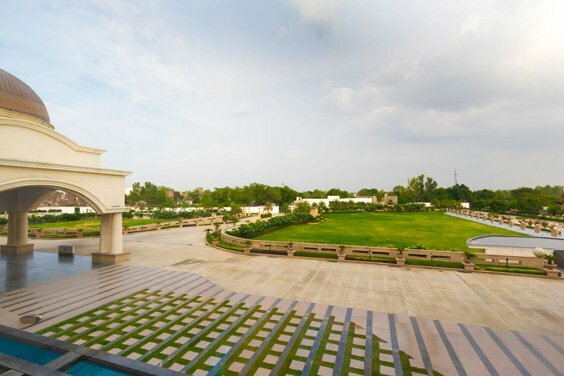 In addition to the huge Amphitheatre and Weddings Lawns (the biggest & grandest in Lucknow), a Panchkarma Wellness Centre; state-of-the-art Entertainment Zone – Ramada Lucknow never ceases to delight you with its amenities and facilities. As the closest international hotel to the Chaudhary Charan Singh International Airport, Lucknow, with 107 rooms, the hotel has a clear advantage for business travellers and event co-ordinators, in accessibility, accommodation and value for money. 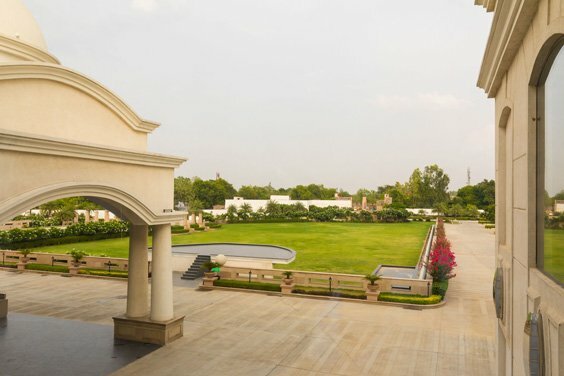 With a combined outdoor event space of 8361 + sq m, and an impressive 2044+ sq.m of flexible indoor space, supported by an experienced and dedicated event team, the best business hotel in Lucknow will help you create your event that is perfectly tailored to your particular needs and schedule. Be it organizing a day meeting for 10 or a product launch for 5000 people, Ramada Lucknow is the place for you! 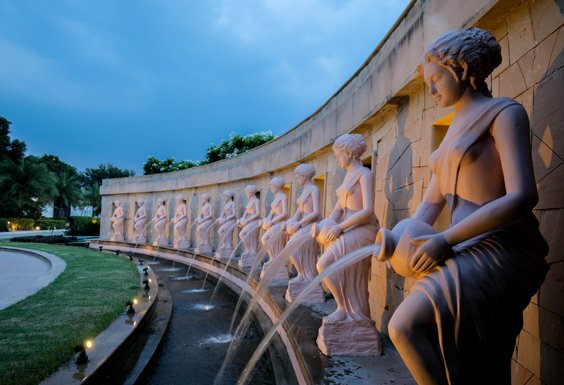 Set amongst more than 10 acres of perfectly manicured rolling lawns, Ramada Lucknow radiates tranquility. For the weekenders, the 8361+ sq ft of emerald green in Lucknow city’s suburbs, along with Ramada Lucknow’s state-of-the-art Entertainment Arcade and Food Court offers convenient dining, shopping and professional services are perfectly suited for families on a weekend visit. 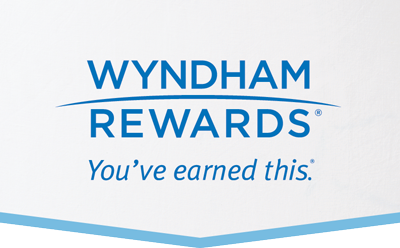 For those choosing to stay in one of our elegant guest rooms or the elegant suites, enjoy our extensive world-class Panchkarma wellness facilities, upscale dining experiences over and above the food courts, cool yourself in the luxury pool or recharge yourself at the modern gymnasium . To ensure your visit to Lucknow is a trip to remember, we will go the extra mile to meet all your expectations.